Hello, I am a noob to ISBoxer. I am trying to set it up for a specific scenario, but I seem unable to do so, even after watching several videos. Basically I want to use ISBoxer only as a key/mouse repeater and nothing else. I'd load my WoW client on the main screen and I will have a 2nd WoW client running in the background (playing same class on both, planning on clearning same dungeons for twice the loot). So I only want my keys/mouse input that I do in the main WoW window to be repeated onto the 2nd WoW window, that all, nothing else. How would I be able to have such a setup? Do I really need to launch the 2 game clients through ISBoxer? Why wouldn't it work with both game clients manually launched by me? I don't like the idea of ISBoxer messing around with my game config files, so I'm not comfortable in letting ISBoxer launch the game clients for me. What options do I have in order to achieve my need? Daeveren wrote: Do I really need to launch the 2 game clients through ISBoxer? Daeveren wrote: Why wouldn't it work with both game clients manually launched by me? Because then ISBoxer doesn't get a chance to tell the game to use it's virtualized input system, which is how it manages to send commands to multiple windows at the same time. Take a simpler process. You launch two notepads, and type away, how are you going to get the keystrokes to appear in both notepad instances at the same time? You need a new input system, which is what InnerSpace is providing and ISBoxer is controlling. Daeveren wrote: I don't like the idea of ISBoxer messing around with my game config files, so I'm not comfortable in letting ISBoxer launch the game clients for me. ISBoxer doesn't mess around with your game config files. Initially it copies your original config.wtf file, and creates config-CHARNAME.wtf files for each character. When the game is launched via ISBoxer, then ISBoxer virtualizes the config.wtf file, so each time the game says I want to access config.wtf, ISBoxer says, here load this config-CHARNAME.wtf file instead. So, the game messes around with the games config files, not ISBoxer. ISBoxer just happens to tell it to use a different file to what it originally asked for. This way, your multiboxing setup doesn't mess around with your single toon experience. The toolkit does initially check to make sure your config-CHARNAME.wtf files that is copied from your config.wtf has settings which are needed in order to be able to have more than one game instance running AND accept input. You can CHOOSE not to let it fix any issues it finds, but you also might find it then doesn't work as you expect. If you do choose to fix it, then yes, this is the one time it will mess around with your config files, but take note, it does not mess with your config.wtf file, but rather the copies it made specifically for your multiboxing setup. At all other times the thing that messes with the files is the game; like it's supposed to. Daeveren wrote: What options do I have in order to achieve my need? Not a lot if you insist on not letting ISBoxer work how it needs to work. As for your repeater issue, that one is fairly easy. You launch the character set from the InnerSpace menu, choosing ISBoxer Character Sets -> name of your team. Load up, log in, Disable Key Maps, Enable Repeater. All done. Everything you press on the main will be broadcast to both Windows. If you don't want to do this all the time, you can during the Quick Setup Wizard, on the final page, choose a Generic Broadcasting config. Pay attention to the items I've highlighted. 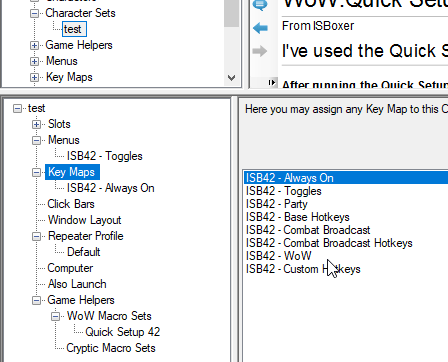 From there, because of a bug, you should then select your character set in the top left, in the lower left, select Key Maps, and in the lower right, unhighlight everything except "ISB42 - Always On"
And that's it. When you get in game, don't enable the ISBoxer Addon (we could stop it from generating altogether, but it won't hurt anything because you wont be loading it), and you have a very simple broadcasting setup. SHIFT+ALT+R or your chosen hotkey, will enable/disable it as needed. Thanks a lot for your reply. Even having tried to manually understand each setting (both manually or through the wizard) and even after having watched several tutorial videos these questions remained completely unanswered until you replied here. So it's great that ISBoxer creates virtual/separate config.wtf files. Does this also means that allowing it to modify the foreground/background max fps setting is only going to be used for these virtual config files? Just to make sure, regardless of the settings that I've set in ISBoxer, launching the game manually by myself later on will preserve my original config.wtf file, right? ISBoxer's foreground and backgroupd FPS limiting is not enforced by using the games settings. It manages it via DirectX. And yes, correct, launching the game normally, will use the games normal config.wtf file. When using ISBoxer, it will use the copies it makes for each character. note: it only creates the copies if you select WoW as the game you want to play on the first page of the Wizard - if you select a different game, or Other, it wont create the correct virtual file settings for WoW, and then multiboxing will mess with your config.wtf. Unfortunately it is not something usable for me. While I switch between the windows, it compeltely freezes my pc (a fairly new one - core i7 9700K) - the image is completely frozzen on the screen, the sound still works, but no inputs work at all (no Esc, no keybinds, no ctrl+alt+del, no ctrl+shift+esc), only solution is a restart. And then it all repeats soon after I start the game again. If you have any idea about what might cause it, I could then give it another try. Try using DirectX 11 rather than DirectX12. DirectX12 can be hard on systems, especially when multiboxing.